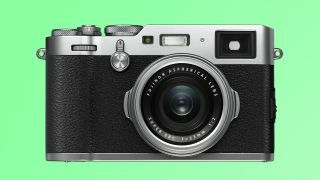 The original Fujifilm X100 was the camera that launched the company’s mirrorless series, and now we’re finally getting its latest iteration. The Fujifilm X100F follows the Fujifilm X100T, packing a higher-resolution 24.3MP X-Trans III CMOS APS-C sensor. Another improvement is the enhanced optical viewfinder, which now offers an additional 6x magnification in addition to the original 2.5x. Fujifilm has also increased the electronic viewfinder’s frame rate to 60fps, to help street shooters capture action in real time. The autofocus system has been dramatically upgraded too, with 91 autofocus points – up from the previous 49 – to help with shooting action. Aesthetically, Fujifilm has made some tweaks to the X100F control scheme compared to the X100T, including shuffling all the rear buttons to make more room for users to place their thumb. An AF joystick, as seen on the Fujifilm X-T2 and X-Pro 2, has also been added. For the fourth time in a row, Fujifilm has stuck to its guns with the Fujinon 23mm f/2 lens, but the optic arguably still holds it own, even after all these years. However, we’re most disappointed that this street shooting-focused camera still doesn't come with weather sealing. The Fujifilm X100F will be available in February for $1,299 (about £1,060, AU$1,730), in black and silver color options. Earlier last year we saw Fujifilm refresh its two flagship mirrorless cameras, so it seems only fitting that we see the new X-Trans III sensor trickle down to mid-range cameras like the new Fujifilm X-T20, which succeeds the X-T10. In addition to featuring Fujifilm’s latest 24.3MP X-Trans III sensor, the X-T20 features new touchscreen controls that enable you to both capture shots and review your images. The X-T20 also seed a host of other improvements including a 4K video shooting up to 30fps and a boosted ±5 stops of exposure compensation. Users can now also add a Grain effect for a distinctive film-like graininess, in addition to Fujifilm’s film-simulation filters. Like the Fujifilm X100F, the X-T20 features 91 autofocus points that cover the entire image sensor. Also arriving in February, the Fujifilm X-T20 will be available in black and silver color options, and is priced at $899 (about £730, AU$1,200). Users will also be able to purchase the mid-range camera as a kit with the XF 18-55mm lens for $1,199 (about £1,630, AU$1,600), or with the XC 16-50mm lens for $999 (about £810, AU$1,330). Fujifilm has also added a new 'nifty fifty' to its lens family in the shape of the XF 50mm f/2 WR. As the name suggests, this will be the company’s latest weatherproof lens, while internally the lens is made up of nine glass elements in seven groups, with one aspherical extra-low dispersion lens. If you’re looking for an affordable way to get into Fujifilm’s X-series camera system, teaming the X-T20 with the XF 50mm f/2 WR, which will be available next month for $449 (about £370, AU$600), is the way to go.